We recently acquired a trio of stunning jewels all made by the same designer: KK. 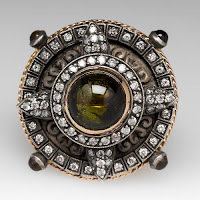 These jewels are of baroque design, featuring stunning semi-precious tourmalines in a range of colors, from ruby wine red, to murky yellow-green, to verdant shamrock green. These statement rings are astonishing in both design and execution. Crafted from sterling silver and solid 18k yellow gold, these rings are masterpieces in design. The first is a north-south dinner ring featuring a cabochon rubellite tourmaline set bezel style in a halo of white diamonds. These are all set in a patina finish. Scrolling flourishes lead the eye to the stately panthers that lie atop and below the gorgeous central stone. On the bright yellow gold shoulders rest an almost-leaf-like flourish studded with diamonds set in channels of silver patina. 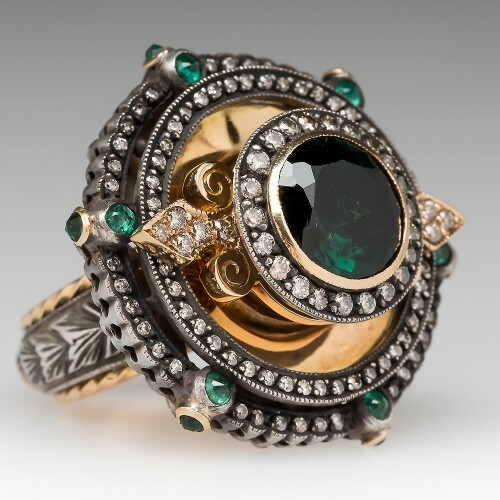 The second ring features a central bezel-set, shamrock green tourmaline surrounded by a halo of diamonds in an oxidized sterling silver channel. In brilliant 18k yellow gold, a pair of diamond-studded fleur-de-lis radiate in an east-west direction. A bowl of yellow gold underlies the entire central design. This bowl is encircled by a double halo of diamond-studded silver. 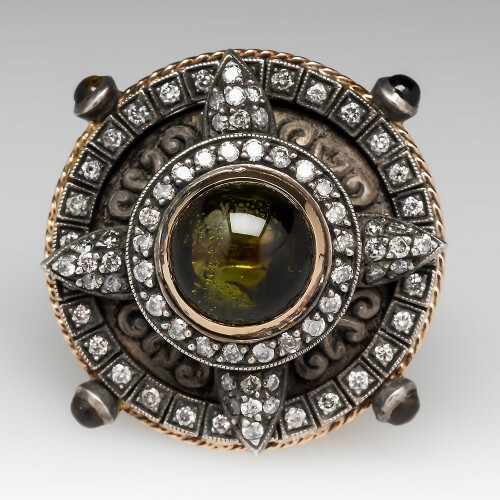 The outer rim is punctuated by evenly spaced dimensional bezels featuring smaller green tourmalines. The shank of the ring is completely etched in sterling silver, gilded by a rim of twisted yellow gold. The entire ring, underside and all, is a masterpiece in design. The final ring in the KK mystery designer trio is a study in oxidized silver. The only gold can be seen on the inside of the band, in the twisted braid of gold around the gallery, and the gold bezel around the mossy green tourmaline cabochon placed at the center of this exquisite statement ring. Surrounding the bezel-set tourmaline is a rim of silver embedded with a halo of white diamonds. Four points emerge from the halo, also studded in diamonds. A second halo forms the outer rim of the design and features square individual bezels in silver set with a single round diamond. The edge is trimmed in braided gold with four cabochon tourmalines set horizontally to the design. The band is coated in beautifully etched sterling silver. This ring is an understated wonder. 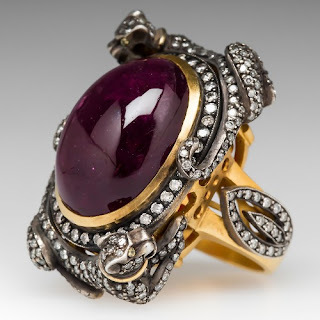 All of these rings are engraved with two letters, the only letters giving credit to the masterful mystery designer: KK. The letters are engraved within a horizontal etched diamond. After doing extensive research online, I have been unable to track down this mystery designer. I've found a number of KK designers out there, but none of them equal the artistry of these beautiful rings. That is why we need your help. If you have any information regarding the mystery woman or man behind these gorgeous Gothic rings, please get in touch with us. Simply fill out this contact form and let us know what you know.